The aim of the study was to prove without doubt that the environmentally friendly toilet friend units, that effectively prevents unpleasant toilet odours from escaping from the bowl when a toilet is used and flushed, also reduce the spread of airborne bacteria and viruses found in faeces. Several studies conducted on the aerosol effect when a toilet is flushed, showed the spread of airborne bacteria and viruses and contamination of the toilet environment, even adjacent toilets as well. Bacteria and viruses also cling to your clothes, towels, toothbrushes, shoes, floors, taps, walls etc. and you easily inhale and swallow them, resulting in the possibility of contracting different types of infections. Several strains of different bacteria are spread through the faeces, one of them being Clostridium difficile and another Methicillin-Resistant Staphylococcus Aureus (MRSA). These two superbugs are a major cause of concern. Conclusion: Proof was obtained that a reduction in the spread of bacteria was obtained when toilets that had a toilet friend unit installed, were used. Therefore, it can be claimed that the toilet friend units will successfully contribute in creating a more hygienic environment, automatically and maintenance free. No hazardous air fresheners will be necessary anymore. Disinfecting and cleaning programs will be much more effective. With no contaminated filters or any disposable parts to replace, these units are an asset not recognised up to now. They were mainly used to eliminate foul and unpleasant odours resulting from the use of a toilet, not realising the real contribution in creating and enhancing a hygienic environment, especially over a period of time. 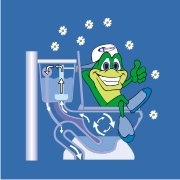 Every hospital, nursing home, surgery, household, pharmaceutical and other industries, restaurants, pubs, schools etc should install toilet friend units to help create and control environmentally friendly, hygienic environments, hassle free. « How does the Toilet Odour Removal System work?